When working on database/data warehousing projects one gets to work on multiple environments Development,QA,UAT and Production. One of the tasks that is usually done very frequently is that of comparing database objects. In a database/datawarehosuing project the database objects get constantly moved from one environment to another environment and very often there is schema's on the different environments need to be compared to see if there are any differences.I was referred to a tool by a SQL Server blog Contributor/Developer Imran Mohammad. I decided to check the tool out as I am currently doing lot of data sourcing projects where in I have to do lot of database comparisons. The name of the tool is called SQLDBDiff the link for the tool is given below: In the website there are two versions of the tool listed, the freeware and shareware version. The site lists the differences between the two versions, I decided to download the freeware version. The freeware version is in the form of .zip file and I extracted the files and ran the Compare Databases Tool (the file is called SQLDBDiff). 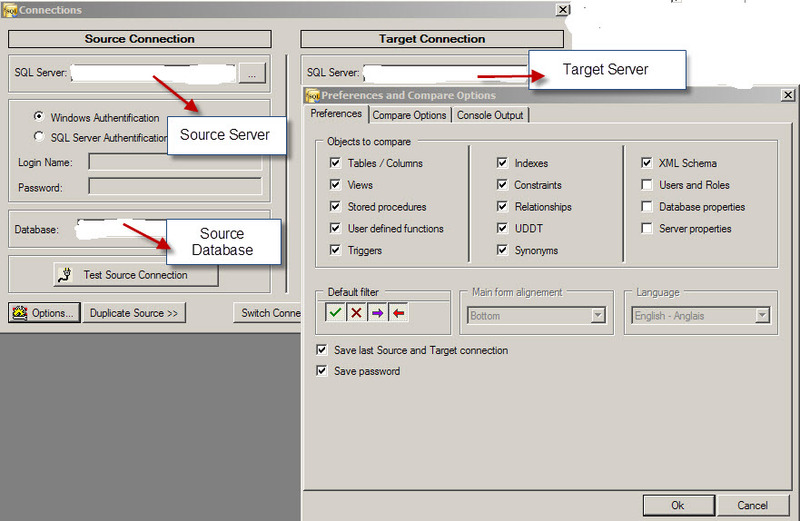 In the Menu Option File one has to choose Compare two databases, this launches a window where one can connect to the source and target databases. Here the source and target databases are the databases where tables and other objects need to be compared. Once these values are filled out there is Options button where in one can check what type of database objects need to be compared. There are a good set of Preferences ranging from tables to Server Properties. There is a Compare options tab where in one can choose options like whether system objects, statistic indexes need to be included for comparison. Once these are all set click the OK button to start the comparison, once the comparison is complete there is a set of tab based windows which appear with the list of objects which have been compared. In each row of the screen one can double click to see the details of the comparison and there is a status column which tell the user the result of the comparison (whether it was the same (green) or not (red)). The freeware version should be good enough for one to get started, in case there are more detailed features like Generate schema and Data synchronization scripts one can get the Shareware version. This should be helpful in windows 8 enhancement. This step by step process will surely get me to installing Sql server support well. I want to learn SSAS. Please let me know which book i can refer for this. http://msbiacademy.com/ This site has lot of resources for SSAS and other aspects of Data Warehousing.